The Occupy Wall Street movement began with a burst of favorable press coverage that was reflected in a largely positive public perception of the movement. 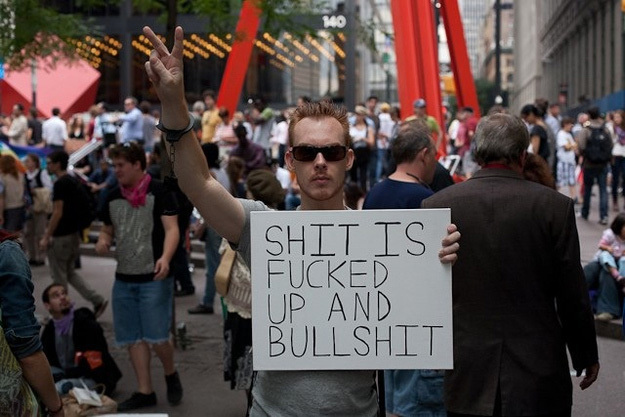 However, as time went on and murders, rapes, assaults, and public urination, defecation and masturbation became the hallmarks of OWS, the public soured on the protesters. That was inevitable; it is hard to see how protesters who squat in public places week after week can do anything but wear out their welcome. The extent to which this has happened is shown by Scott Rasmussen’s latest survey on OWS. Fifty-one percent of likely voters now see OWS as a “public nuisance,” while only 39% see them as “a valid protest movement representing the frustrations of most Americans.” There is still room for those numbers to get worse, which they will as long as the OWS crime spree continues. Now, for liberals, the question is how to bring the OWS demonstrations to a merciful conclusion before they do further damage. JOE adds: Since we’ve used it several times, readers may want to enjoy full-sized documentation of our iconic Occupy protester.